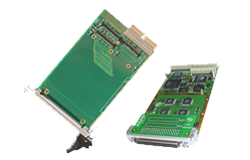 The ARINC CPCIC-A429/PXI Interface Card and AltaAPI Support Software Represent the Latest ARINC 32-bit FPGA Protocol Engine Technology. Encode and Decode almost Any ARINC-429 PHY Level Label/Word Signal. The First Card in the Industry to Offer Advanced Test Functions of Signal Generation and A/D Signal Capture. 4-30 ARINC Channels: Up to 16 Shared RX/TX & 14 RX Channels. PMC on 3U or 6U cPCI Carrier. PXI Compatible. Alta Data Technologies’ CPCIC-A429 interface module offer a variety of ARINC-419/429/575/573/717 channel configurations with software selectable RX/Tx channels, baud rates, bit encoding and word configurations (Start/Sync/Stop length, Parity, bits/word, MSB/LSB). The CPCIC-A429 card is based on the industry’s most advanced 32-bit ARINC FPGA protocol engine, AltaCore™, and a feature-rich application programming interface, AltaAPI™, which is a multi-layer ANSI C and Windows .NET 2.0 (MSVS 2005 C++, C#, VB .NET) architecture. This hardware and software package provides increased system performance and flexibility while reducing integration time. The CPCIC-A429 Transmit (TX) capability includes both simple and complete frequency control options for each channel. TX also includes Playback and Signal Generator operations. Dual Receive (RX) functions include independent simultaneous channel level buffering and multi channel level buffering. AltaCore is guaranteed ARINC-419/429/575/573/717 compliant and all cards are manufactured to the highest IPC-Level 3 standards and certified ISO 9001:2008 processes. Alta is committed to provide each customer with a risk free integration and will help with any level of your system development. Here you can find documentation pertaining to the CPCIC3/6-A429 - PXI. For additional documentation and software, please visit our secure download area. CPCIC3-A429-4-T 3U cPCI Interface (PMC on Carrier) with 4 Shared Tx/Rx Channels of ARINC-429 and 2 Rx/2 Tx ARINC-717 Selectable Channels (Each 717 Rx/Tx Replaces Two 429 Channels). Included:Thumb Screw SCSI I/O Connector (Must Use -T Series Mating Connector) and AltaAPISoftware. CPCIC3-A429-8-T 3U cPCI Interface (PMC on Carrier) with 8 Shared Tx/Rx Channels of ARINC-429 and 2 Rx/2 Tx ARINC-717 Selectable Channels (Each 717 Rx/Tx Replaces Two 429 Channels). Included: Thumb Screw SCSI I/O Connector (Must Use -T Series Mating Connector) and AltaAPISoftware. CPCIC3-A429-16-T 3U cPCI Interface (PMC on Carrier) with 8 Shared Tx/Rx Channels and 8 Rx Channels of ARINC-429 and 2 Rx/2 Tx ARINC-717 Selectable Channels (Each 717 Rx/Tx Replaces Two 429 Channels). Included: Thumb Screw SCSI I/O Connector (Must Use -T Series Mating Connector) and AltaAPISoftware. CPCIC3-A429-30-T 3U cPCI Interface (PMC on Carrier) with 16 Shared Tx/Rx Channels and 14 Rx Channels of ARINC-429 and 4 Rx/4 Tx ARINC-717 Selectable Channels (Each 717 Rx/Tx Replaces Two 429 Channels). Included: Thumb Screw SCSI I/O Connector (Must Use -T Series Mating Connector) and AltaAPISoftware. CPCIC6-A429-4-T 6U cPCI Interface (PMC on Carrier) with 4 Shared Tx/Rx Channels of ARINC-429 and 2 Rx/2 Tx ARINC-717 Selectable Channels (Each 717 Rx/Tx Replaces Two 429 Channels). Included: Thumb Screw SCSI I/O Connector (Must Use -T Series Mating Connector) and AltaAPISoftware. CPCIC6-A429-8-T 6U cPCI Interface (PMC on Carrier) with 8 Shared Tx/Rx Channels of ARINC-429 and 2 Rx/2 Tx ARINC-717 Selectable Channels (Each 717 Rx/Tx Replaces Two 429 Channels). Included: Thumb Screw SCSI I/O Connector (Must Use -T Series Mating Connector) and AltaAPISoftware. CPCIC6-A429-16-T 6U cPCI Interface (PMC on Carrier) with 8 Shared Tx/Rx Channels and 8 Rx Channels of ARINC-429 and 2 Rx/2 Tx ARINC-717 Selectable Channels (Each 717 Rx/Tx Replaces Two 429 Channels). Included: Thumb Screw SCSI I/O Connector (Must Use -T Series Mating Connector) and AltaAPISoftware. CPCIC6-A429-30-T 6U cPCI Interface (PMC on Carrier) with 16 Shared Tx/Rx Channels and 14 Rx Channels of ARINC-429 and 4 Rx/4 Tx ARINC-717 Selectable Channels (Each 717 Rx/Tx Replaces Two 429 Channels). Included: Thumb Screw SCSI I/O Connector (Must Use -T Series Mating Connector) and AltaAPISoftware.